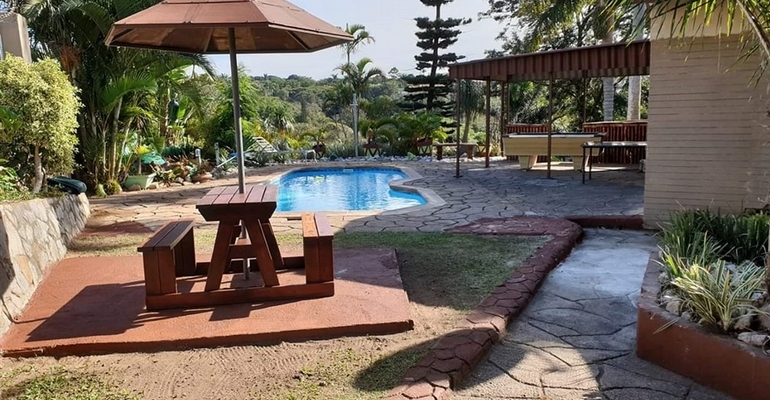 Angelina's upmarket self catering accommodation in Margate offers 3 bedrooms that can sleep up to 10 people, and is the ideal environment to unwind and experience a wonderful holiday. The 3 bedrooms include a large main bedroom with a double bed and dresser, the second and third bedrooms also have double beds. All the rooms are completely tiled with built in cupboards, and are all air conditioned. There is also a fully equipped cottage with an en-suite bathroom. Come relax in the bamboo cabana's jacuzzi, or sip on an appetizer from the bar, near the the built in braai area. Enjoy the surrounding bird life in our colourful garden with soothing water features on the swing-bench before taking a relaxing dip in the swimming pool. Clients can contact us to discuss rates depending on the number of guests.